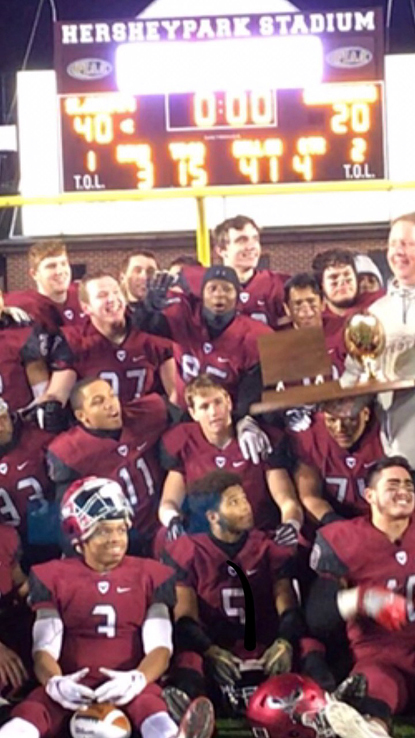 Gabe Infante was asked about St. Joseph’s Prep not performing at its optimum in the PIAA Class 6A state championship against Harrisburg High School Dec. 8 at Hershey Park Stadium. A passerby just emerging from a nap might have thought Infante was lamenting a loss. Not quite. The Hawks had just defeated the District III champion Cougars, 40-20, on a very cold evening in front of several thousand fans. The fact that the Prep played uncharacteristically sloppy football — three lost fumbles, an interception that was returned 25 yards to put the Hawks in an early 7-0 deficit, eight penalties for 74 yards, two unexecuted field goals, one missed extra point — and still beat a team as good as Harrisburg (13-2) by 20 points affirmed the excellence of the Prep’s program. The Hawks have now captured four state crowns in the past six seasons and lost in last year’s finals to Pine-Richland, a defeat the Hawks avenged with a 37-0 shellacking in this year’s state semifinals. After Harrisburg’s aforementioned interception return, the Hawks responded with three first-quarter touchdowns — a 13-yard touchdown pass from sophomore standout Kyle McCord to senior Jonny Freeman, a 59-yard scamper by junior Kolbe Burrell, and a 13-yard connection from McCord to junior Anthony Rightley — to move in front, 20-7. Harrisburg climbed to within 20-14 early in the second quarter, but the Hawks answered less than three minutes later when McCord rumbled home from the one-yard line to enter halftime ahead by 27-14. Undaunted, Harrisburg climbed to within 27-20 entering the fourth, but the Hawks dominated the final frame both offensively (a pair of four-yard touchdown runs by senior Marques Mason) and defensively. As for the latter, sophomore linebacker Jeremiah Trotter Jr. and senior linebacker Myles Talley were unstoppable as both combined for 24 tackles (15 unassisted, nine assisted). Senior linebacker Cooper Kim and junior linebacker Liam Johnson were involved in eight and seven tackles, respectively. The defensive player of the game, however, was Rightley. In addition to his touchdown catch, the hawkish (no pun intended) safety corralled three interceptions, the last of which occurred in the fourth quarter when he ripped the ball out of a receiver’s hands. As his teammates congratulated him, Rightley raced over to the stands in solidarity with the Prep fans that had made the long trek to Chocolate Town. McCord, who shook off the early miscue by completing 26 of 37 passes for 284 yards and two touchdowns and finished the season with 2,883 yards and 35 scores, extolled his gridiron peers for helping him persevere. “I give a lot of credit to my teammates,” said McCord. “A lot of teams would have quit if I did that in a game like this, but they just told me to keep going and keep doing what I’ve been doing all year. For them to have my back even after a play like that was huge. Burrell led all rushers with a season-high 147 yards on 17 carries. Mason added 91 on the ground and 72 through the air via six catches. Sophomore Marvin Harrison Jr. snared eight receptions for 76 yards; Freeman added four grabs for 61. In the end, though, the numbers didn’t seem to matter much to the state champs, just the plaque that they took turns kissing and embracing and sharing with anyone who wanted simply to touch it.